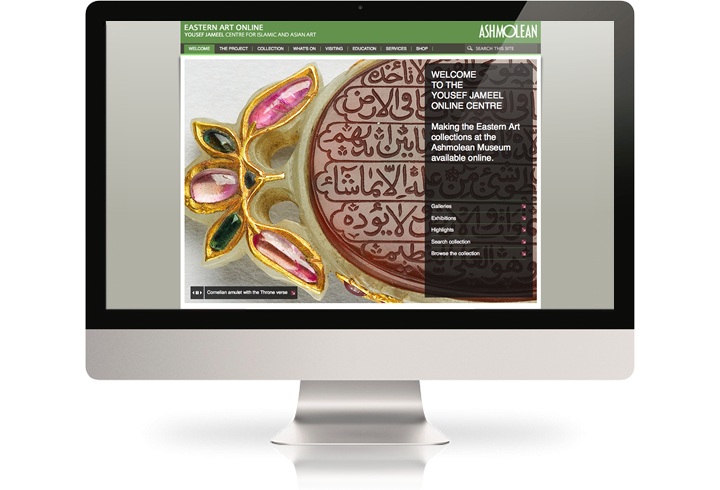 After nearly nine months of thinking, "architecting", designing, refining, converting and working at a close contact with a wonderful client team, the website for the Ashmolean Yousef Jameel Online Centre has come to life. 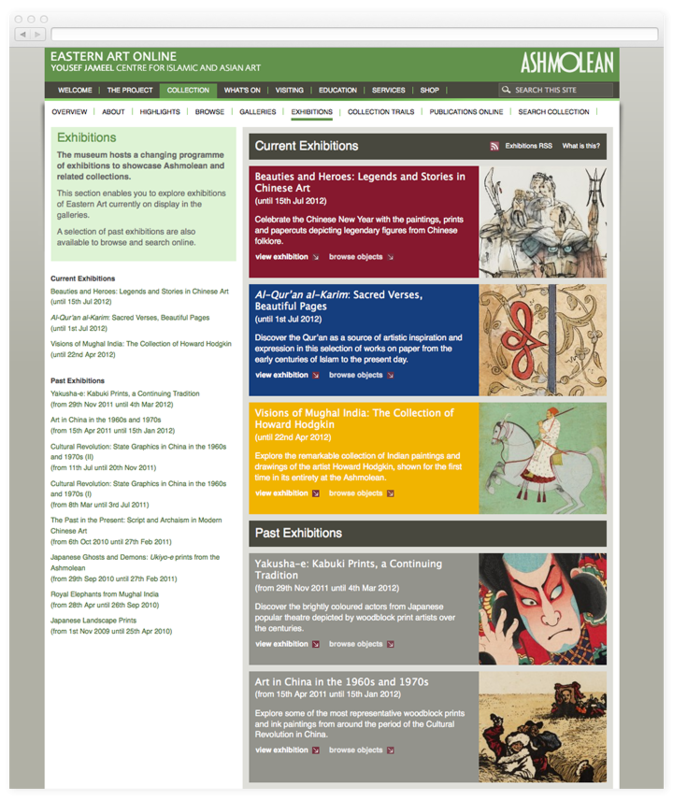 As one of Keepthining's most complex and complete museum collection websites to date, it features multiple routes to explore and research the beautiful Eastern Art collection of the Ashmolean. 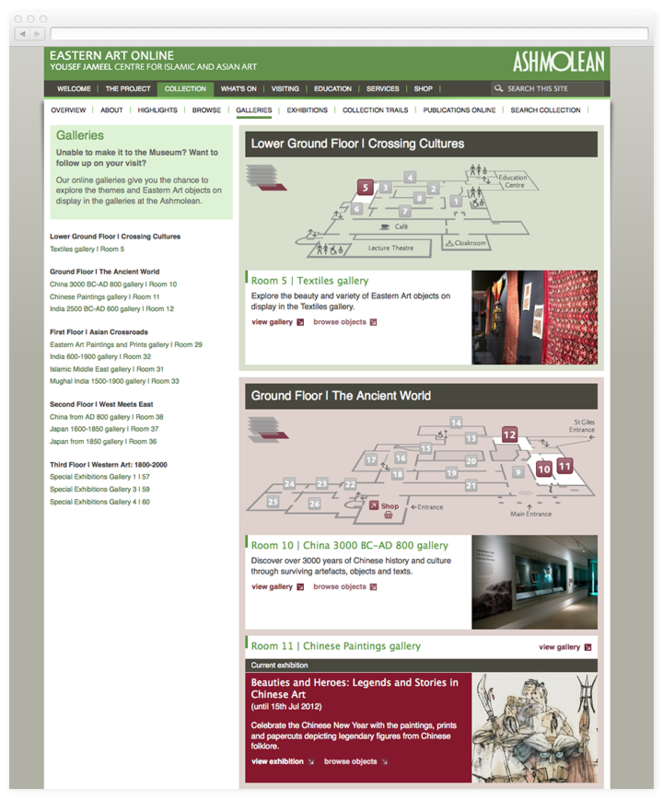 Visitors may choose to view objects by browsing or by searching, by looking at floor plans or at publications. Categorised themes create a unique way to place collection objects in multiple contexts. 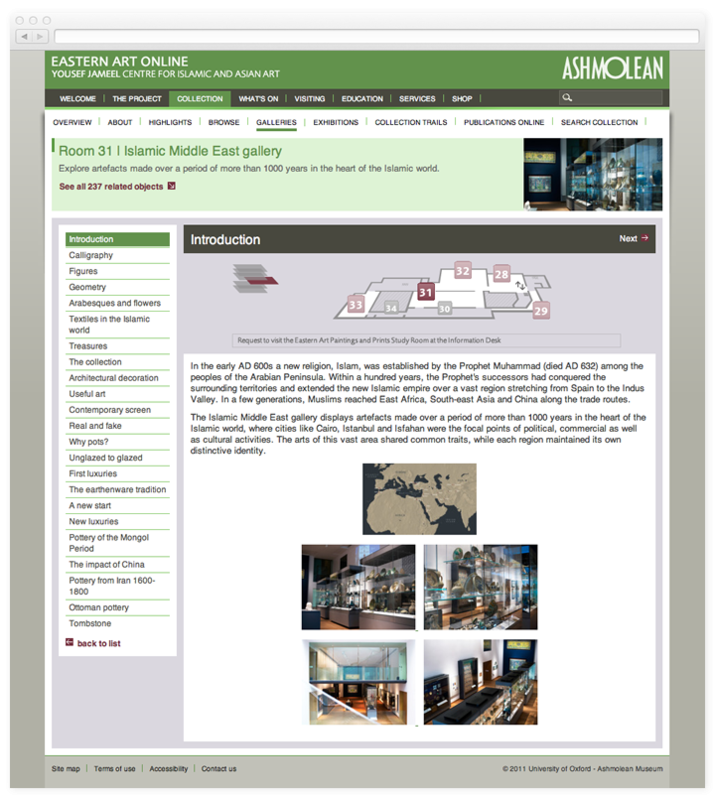 An interactive timeline allows further browsing and filtering, while zoomable images enable detailed analysis. The home page is purposely bold and simple: it unleashes the power of the images captured through a dedicated photographic campaign, which is an essential part of the project. 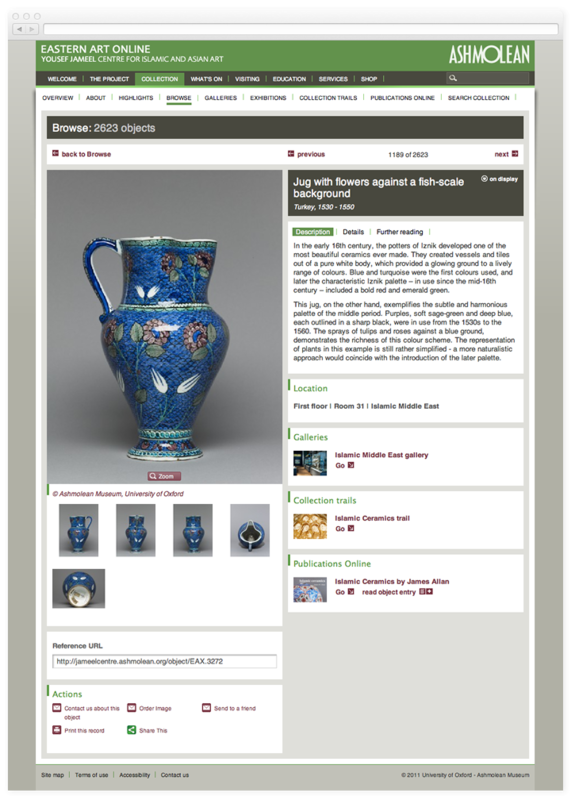 When complete, the whole project will include over 12,000 objects, all of which will be online with new images and detailed meta-data. 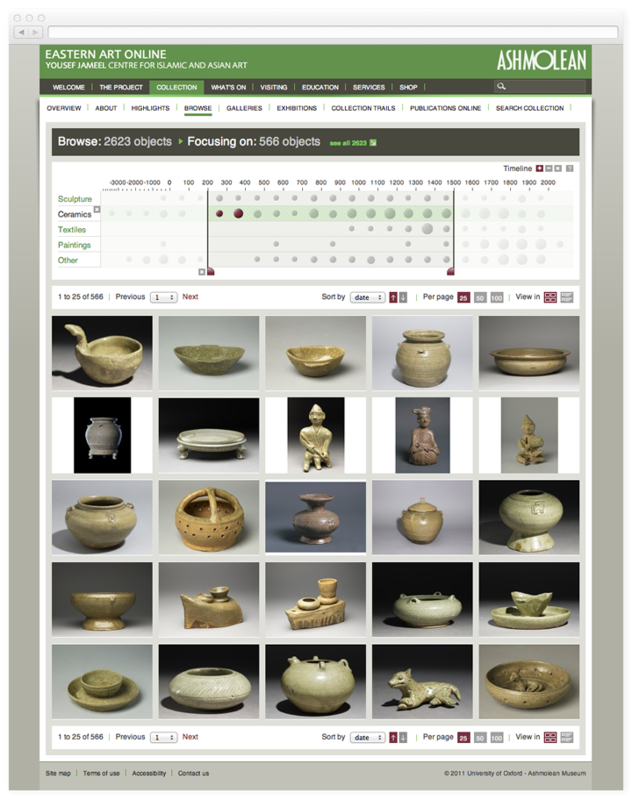 Browsing options include object categories as well as a timeline showing how items are distributed over a period of five thousand years. 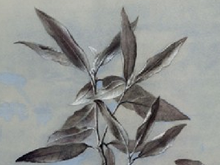 Objects are important as unique destinations, with multiple images and relationships. Objects are also part of potentially infinite contexts and narrative paths - every single vase, jewel or painting links to many others - bringing new life and meaning and allowing an organic, fluid exploration, very similar to what happens in the museum. Thousands of content objects in potentially infinite contexts. 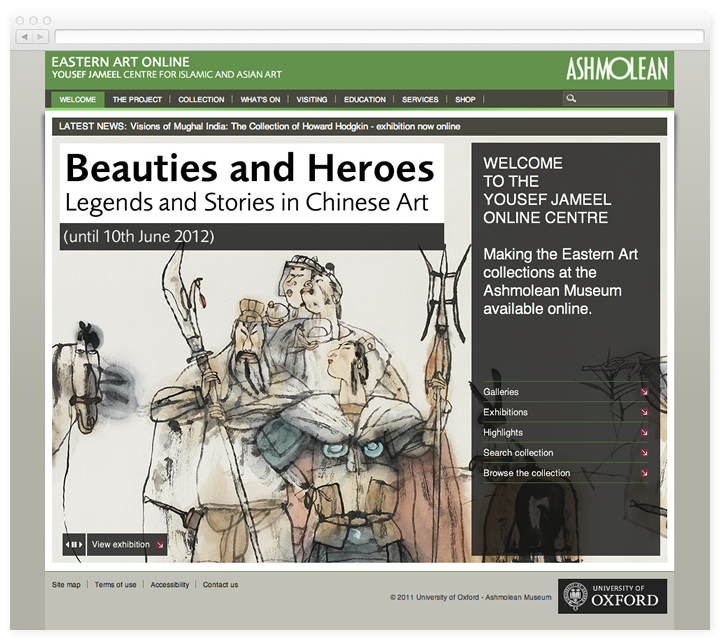 Qi allow the Ashmolean to provide different contextual meaning to objects depending on their context, in this case exhibitions. Just like at the museum, another context for objects is by floor plan. 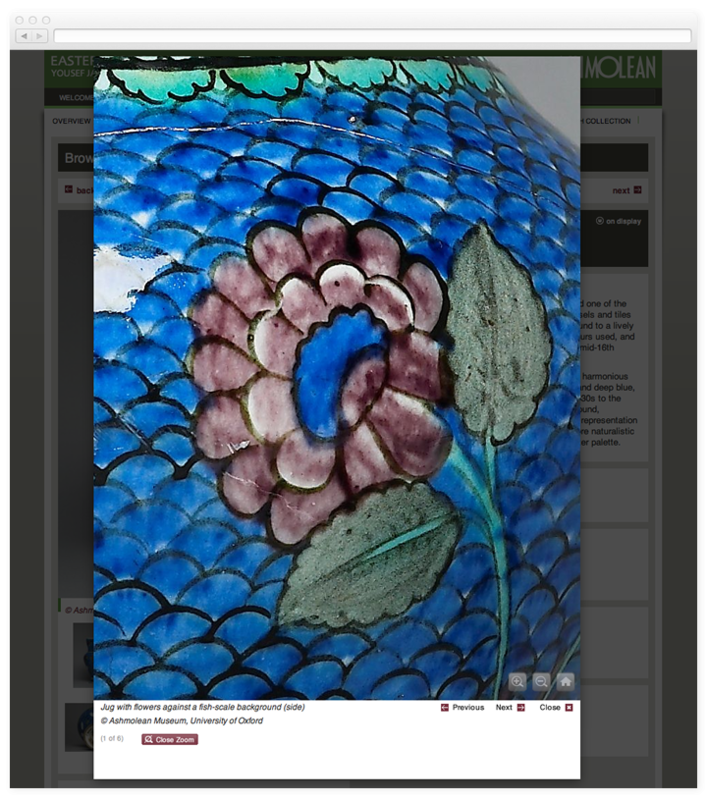 On the website visitors can see every object in each gallery, together with images from the actual installations. Galleries are treated like themes, offering the possibility to create a narrative and a guided tour through the objects.